Sonic synergy illuminates the dark desert of a tribal terrain. European audiences have always been ahead of the curve in their appreciation of electronic music. So it’s no surprise that, while touring Europe in 1993, Steve Roach was spurred into an instant collaboration with German synthesist, Elmar Schulte. Like some would exchange ideas over a beer at a bistro, Roach and Schulte made haste to a recording studio and let their music do the talking. Roach teamed with Schulte at a time when he was producing astonishing solo albums like World’s Edge, Origins and Artifacts and mesmerizing hybrids in collaboration with Robert Rich, Jorge Reyes and Suso Saiz. Roach’s music is unstoppable in its evolutionary development and remains forever fresh and vital, but Ritual Ground represents that period in time when tribal elements became a gripping quotient in the ambient equation. The rhythmic power of tribal music and the warm chill of deep space music combine here to access spiritual caverns with sublime emotional resonance. In its original release from the now-defunct Silent Records, the album was easily missed, due to the fact that neither artist’s name appeared anywhere on the outer packaging. But enjoy it now, like the unearthed masterpiece that it is. Steve Roach’s musical explorations have taken him into many different realms, always touching a primal nerve and evoking brilliant mindscapes for the listener. A respected and much followed solo artist, Roach has also embarked on many collaborations in which the interplay between musicians nourishes the creative process. RITUAL GROUND is the result of one of those instrumental partnerships. In 1993, Roach went to Europe for his first series of concerts outside the United States. While there, he met German synthesizer artist Elmar Schulte, whose own work has appeared on several different European labels. Spurred by their mutual desire to create new, tribal music, Roach and Schulte immediately booked studio time. The result of their intensive meeting of musical minds was this album. Solitaire are Elmar Schulte and Rudiger Gleisberg formed in Berlin at the end of the 80s. They recorded 3 CDs as a duo – their debut in 1990 for Musique Intemporelle followed by Fearless under Recycle or Die in 1995, and then in 1997 Nocturne on Arya (an Amplexus sublabel). But Rudiger left for some years, so for the next two records Solitaire was only Elmar Schulte. 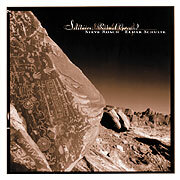 The stakanovist Steve Roach appears on both Plains and Skies (Music Intemporelle, 1992) and Ritual Ground (originally released on Silent, 1993). On the latter he was more than a guest musician; he played on all the tracks and more importantly had an enormous influnce on the third Solitaire masterpiece. Now Projekt have decided to reissue this work with a new cover, and it’s clearer that the CD is a collaboration between Roach and Schulte. Ritual Ground is among the ritual ambient masterworks, rating just under Suspended Memories Forgotten Gods and Hassle/Eno Fourth World: didgeridoo and ocarina find a ‘natural place’ in the wonderful textures created by the synths, the samples and the drum machine. Seven drones that lull you to the depths of musical listenings. Ambient space composer Steve Roach pairs up with Elmar Schulte to create a metamorphosis of ancient acoustics into surreal sound. Both artists are credited with synthesizers, percussion, and drum programming, and each track on Solitaire: Ritual Ground creates its own setting for listeners. “Turning World” and “Solid Ground” venture into the darkness of tribal percussion paired with contemporary spatial soundscapes. Haunting didgeridoos enhance the murky depths of the primordial “Runes.” The set opens and closes with synth strings undulating in atmospheric drift, tones coming and going like lazy ebb tides on a calm night.